As you may have seen in the sneak peek of our nursery (or our weekly pictures of Joanna Lulu), we have a pretty awesome wallpaper going on. We ordered it from Chasing Paper and went with the “Sunburst” pattern (http://www.chasingpaper.com/products/sunburst). 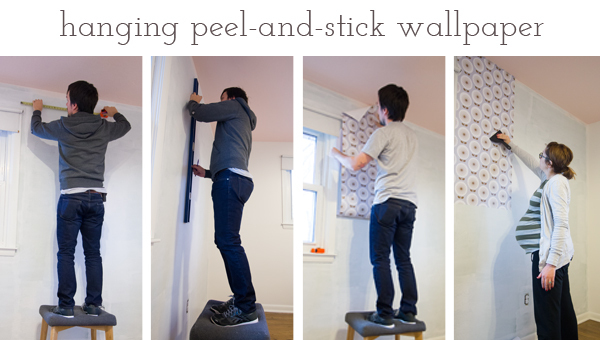 I have memories of peeling wallpaper off of the walls in the house I grew up in, and Kerry has a riveting story about peeling at least 4 layers of wallpaper off the walls of her house as a kid, so my first thoughts on wallpaper were, “Um, no.” But after learning about “peel-and-stick” wallpaper, and seeing the awesome design from Chasing Paper, I thought we’d give it a shot. 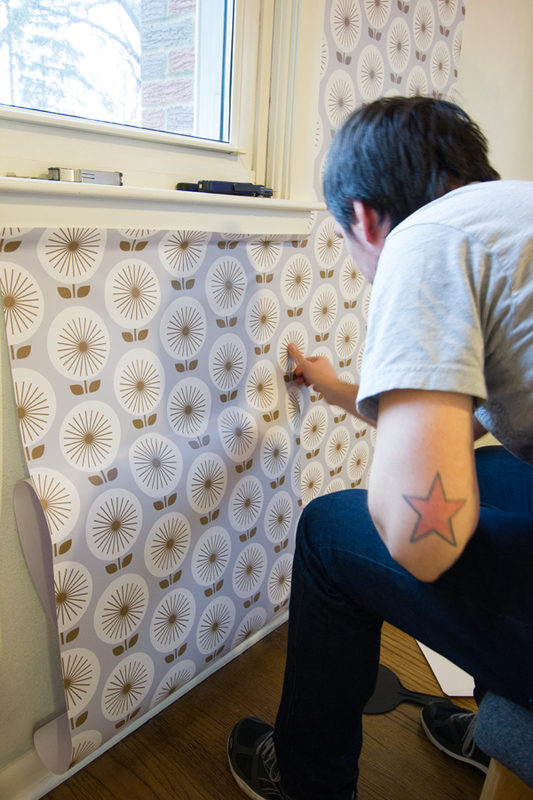 There are plenty of tutorials online about how to do this, and it really is as simple as create a level vertical line, stick your wallpaper up following that line, flatten out the bubbles, repeat. So that’s it, right? We’re done here? Oh, Kerry is telling me I have to talk about why I got to the point where I was swearing at everything in the house. So let’s talk about that. 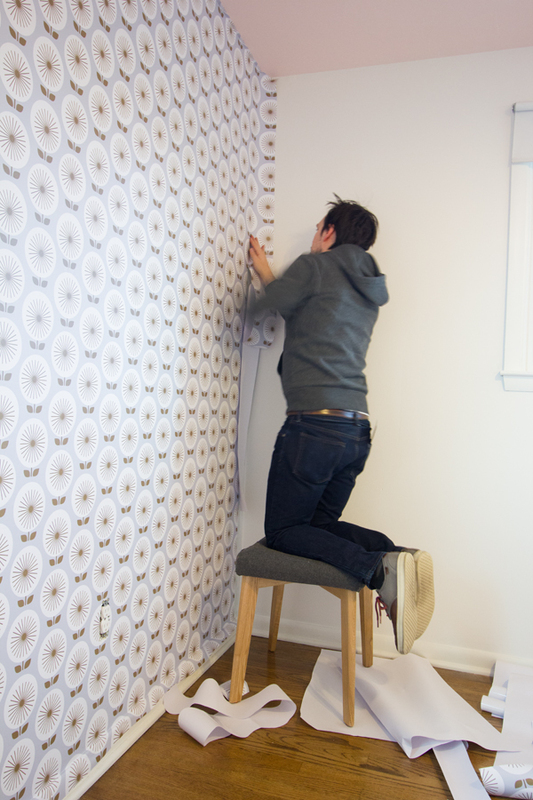 We decided to put the wallpaper on a wall that had a window. If you have the option, I would HIGHLY recommend you do this on a wall without a window. A door would be fine, but a window provided a unique challenge. 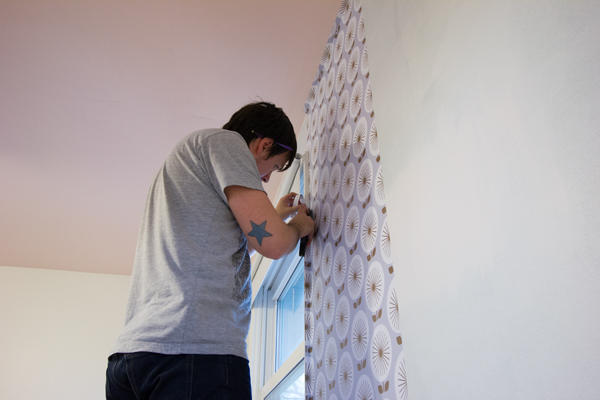 I started the wallpaper directly next to the window, to make sure I was cutting out the least amount possible on the window. Then I had to line up the pattern and move across the window, both on the top, and on the bottom (I was moving right-to-left at this point). Once we got to the left side of the window, and installed from top down, we ran in to a little problem: the pattern above the window and the one below no longer matched up. I don’t know how, but the top strip above the window was about a quarter inch further along than the strip below the window. So when we tried to match them up, there was a gap where the wallpaper wasn’t meeting. This is when I had a little meltdown. I didn’t know what to do and I said a whole bunch of words that I hope Joanna Lulu never learns. After almost giving up, I figured out that this peel-and-stick stuff is a) removable, and b) pretty stretchable. I removed the lower portion and reapplied, this time really pulling it super tight. Eventually, after a while of pulling and stretching as much as we could, we got everything to line up again. If I’m being honest, there are some areas where the seems still aren’t right around the window, but I think I’m the only person that can find them. Kerry doesn’t even know where they are and she’s looked. Going the other way, left-to-right away from the window, was SO MUCH EASIER. When you don’t have to split the pattern, and are just lining things up and moving along, everything lines up really well. This pattern was pretty complex (no two flowers are exactly the same so you have to make sure you’re matching up the right ones), but if you match them up the seams between two sheets disappear. After cutting the extra bits that overlapped the floorboards, corners, and ceiling, the job was done. All in all, it took us two days — but a large part of that was me being “a little too frustrated” when the patterns didn’t match up. And the second day (which was the half of the room without the window) went really quick, and most of it was done with just one person. 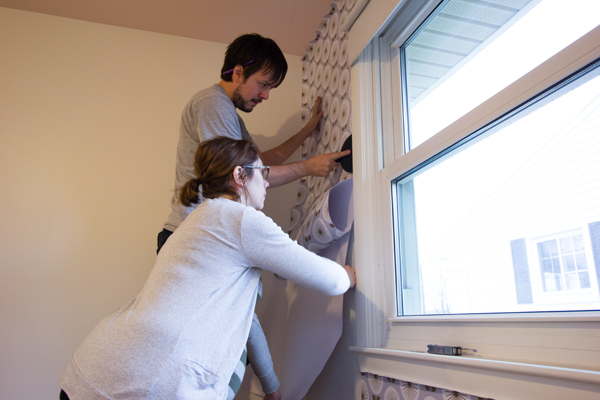 We’ll show you the finished product when we do the big room reveal. The process, despite the frustrations I ran into, was definitely worth it because of how awesome it ended up looking.